Womens vintage hats are really something, they convey a period of glamour that we seem to have forgotten. But you can remind yourself and everyone else of millinery heaven, with our wide selection of Womens hats for and from every decade. We think our versatile range is pretty impressive and we’re convinced you’ll be pleased with what we have to offer. They’re so feminine and stylish that they’re bound to add a finishing to touch to whatever you’re planning on wearing. It really doesn’t matter whether or not you’re entire outfit is vintage, Womens vintage hats can really finish off a contemporary look perfectly. In fact, a mix of contemporary and vintage can really work if you plan it carefully. Our stock is always fluid and growing, to suit our increasing number of customers to our store. 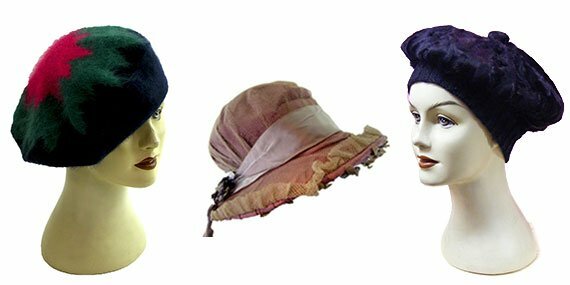 Take a look at our vintage womens hats section and you’re not going to be disappointed, there’s always some to finish off your outfit beautifully, so pop in and take a look around.